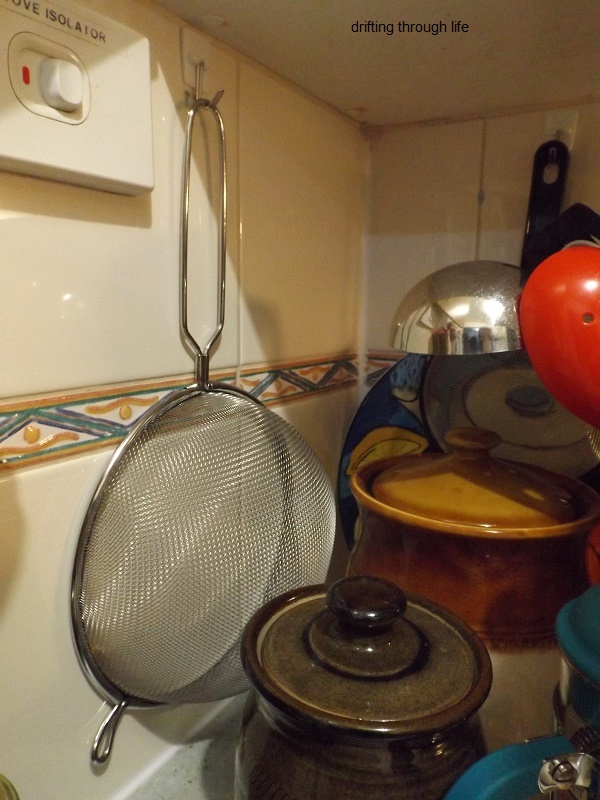 Yesterday, blog buddy joeh, wrote about the storage war in his kitchen, where his beloved wife Mrs Cranky (that's what he calls her) had her dishes stacked in the cupboard like a Jenga puzzle. I decided to show you all how I store my stuff in my teeny, tiny kitchen. 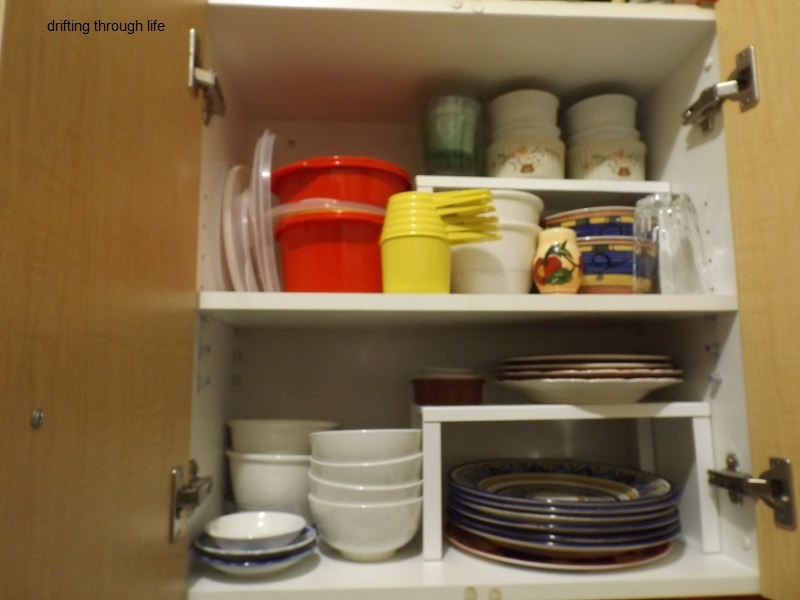 this is my crockery cupboard where everything has its place. See that white rectangular thing between the plates and bowls? 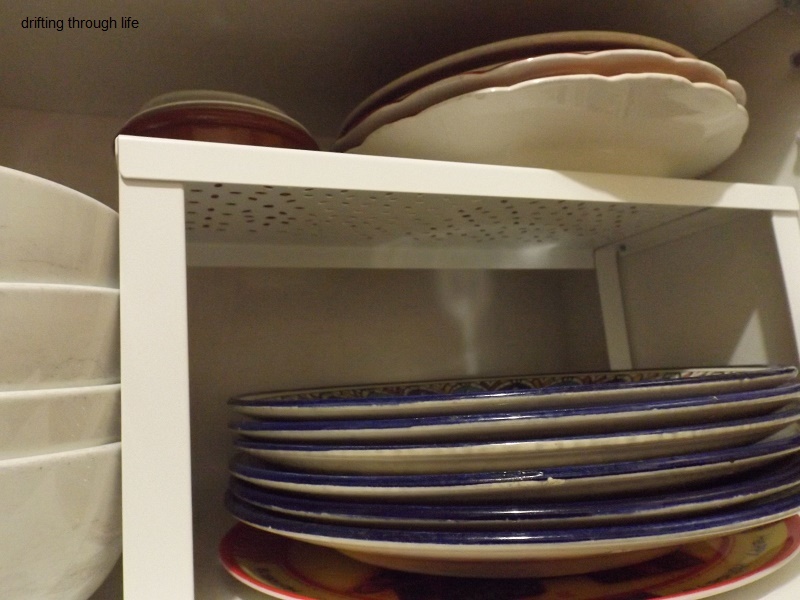 And the same on the top shelf between large bowls and smaller ones. 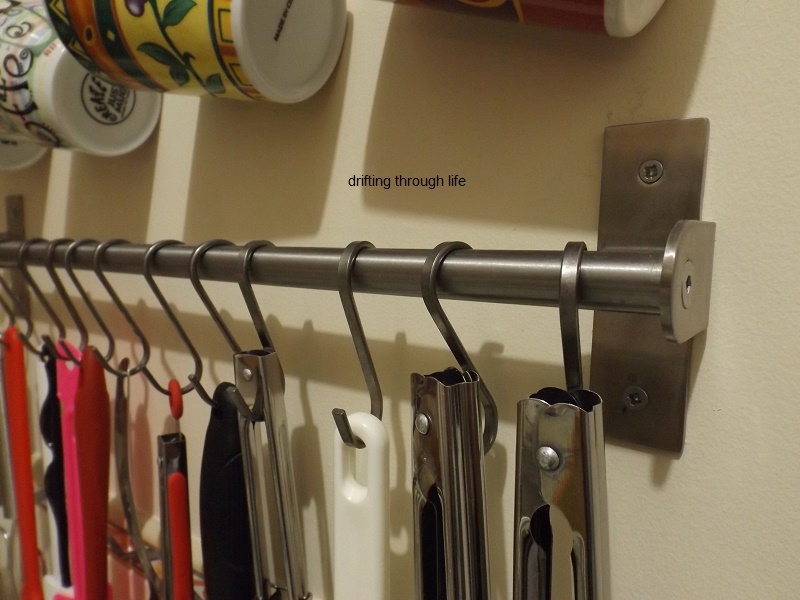 it's a shelf stacker, lightweight metal, bought from Ikea two days after I moved in here, when I got sick of having to pull down or lift up the small plates to get a larger one. 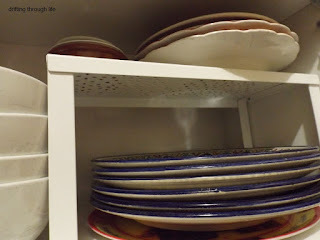 here's a closer look, large plates on the cabinet shelf, smaller plates on the stacker, bowls are off to the side and lesser used things are up on the top shelf. 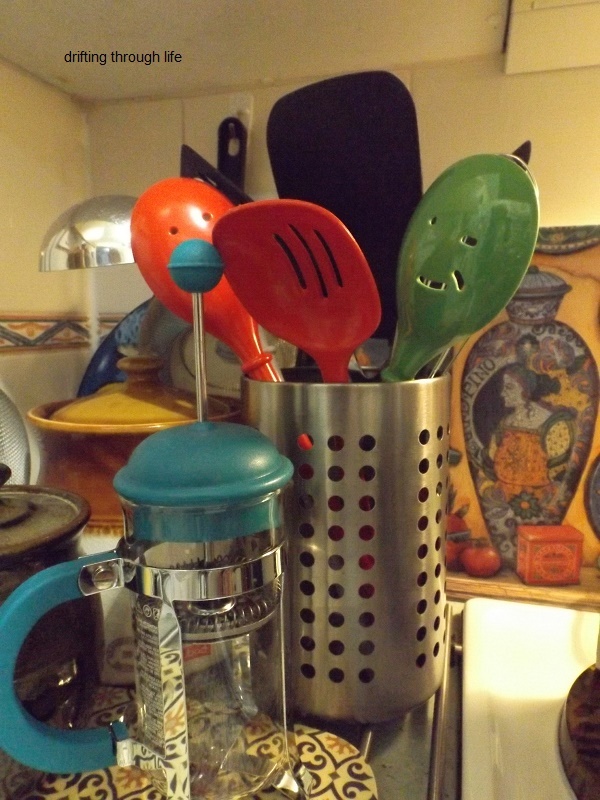 next to the microwave, on the edge of the hotplates is the old chipped mug with the plastic forks and spoons I use for serving up cat food. For Lola of course. two steps away, (literally two steps! 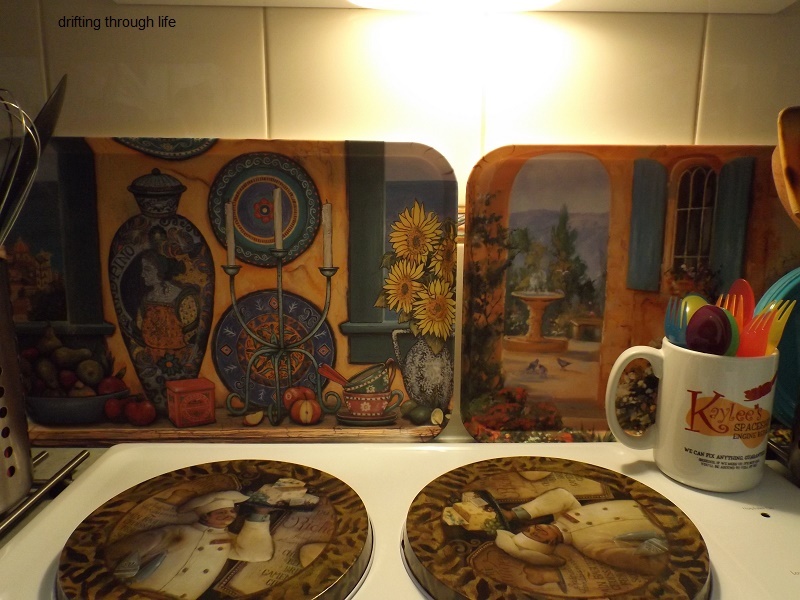 ), is the other corner of the kitchen which I call my coffee corner. 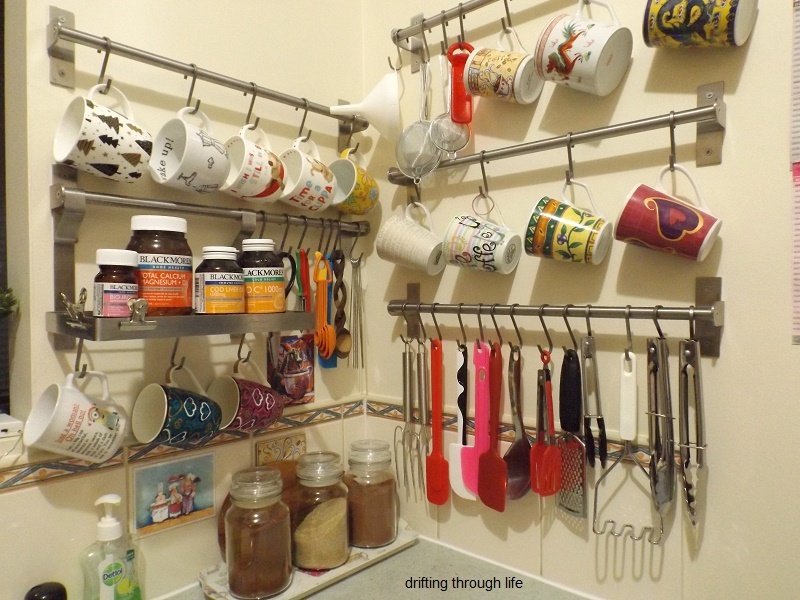 Here you see all my mugs, which don't fit in that tiny crockery cabinet. 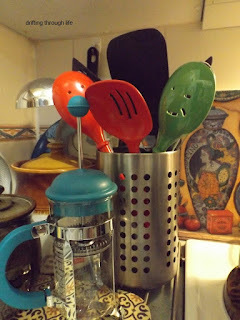 Most of the utensils I use daily are here too, because the drawers are too small to hold everything. 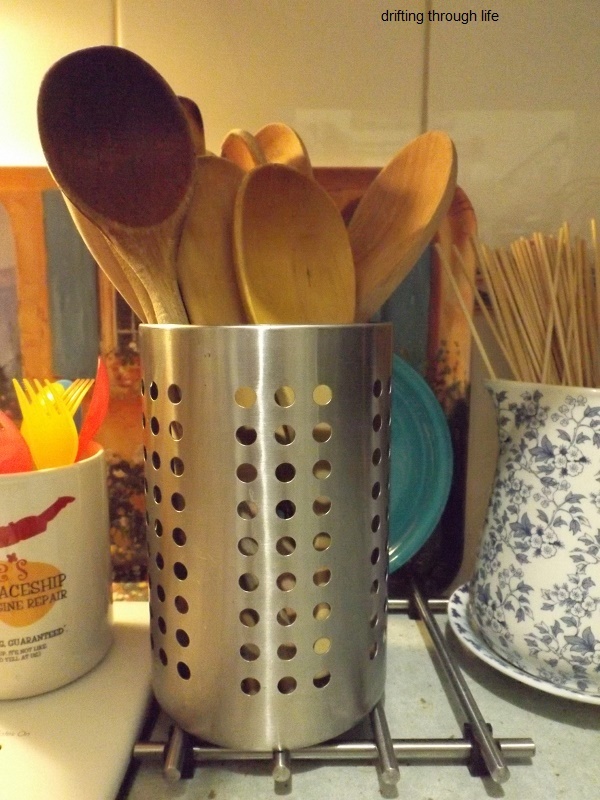 one step to the left is this matching utensil holder with the plastic utensils used for the nonstick cookware, all the saucepans are in the skinny cupboard just under this tiny section of benchtop. The brown stoneware container in the back corner holds herbal teabags and the smaller on in front and to the left of the plunger is filled with honey, for the tea of course. and my oven mitts, the small pair are thinner and more suited to bringing hot dishes out of the microwave, the striped pair are elbow length, insulated and great for getting things out of the real oven. 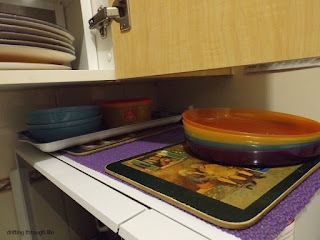 the plastic trays behind the hotplates catch any splatters from cooking and are easily taken to the sink for washing, much easier than me trying to reach in and crick my neck and strain my shoulders trying to wash down the tiles. 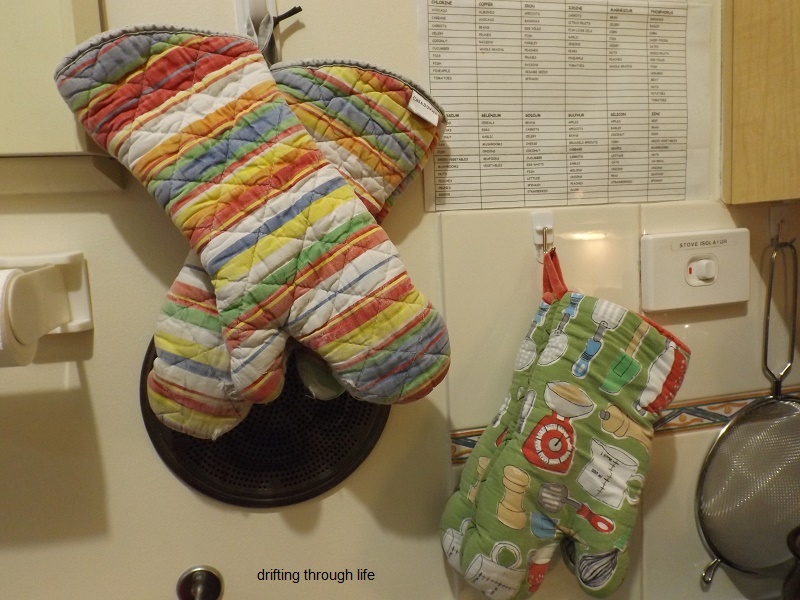 So that's most of my kitchen, half a step left from the oven mitts is my fridge and that's right up against the door opening (no actual door just a space) to the living room. 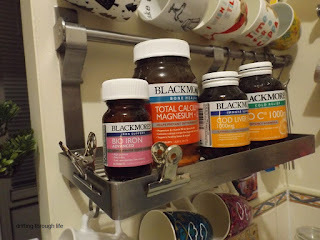 I love your organizational ideas - I am also super organized and I love putting things 'in' things to keep everything neat and tidy. 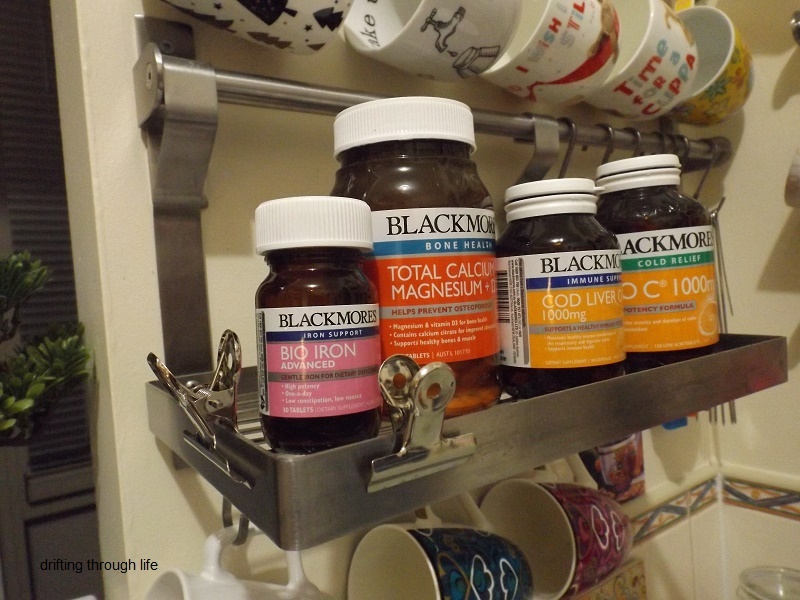 I've used those shelf stackers when I had a itsy-bitsy kitchen. My 'old' kitchen had lots of storage and my 'new' kitchen has even more, and more countertop space as well, so I'm loving my kitchen reno. BTW - who (or what) is Milo? 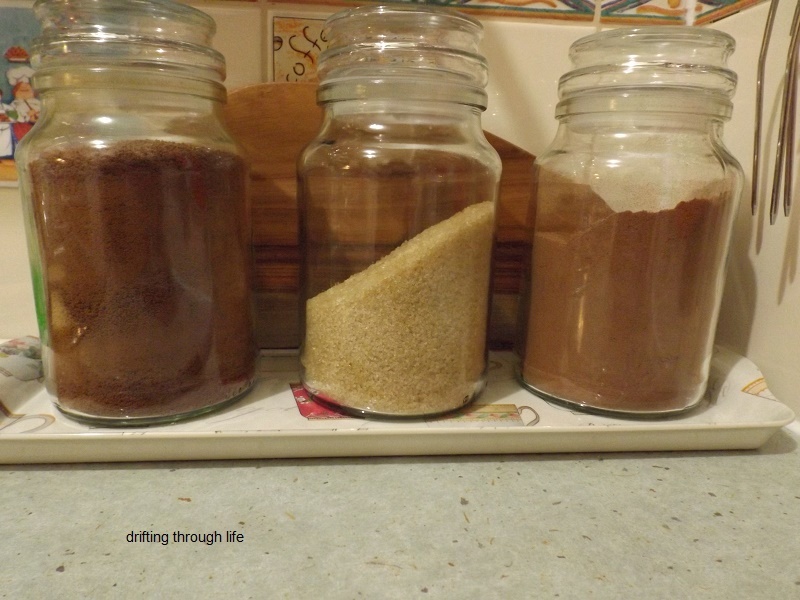 Grace; this is the smallest kitchen I've ever had and I miss have more counter space and storage. I've had to give away so much stuff because I just don't have room. 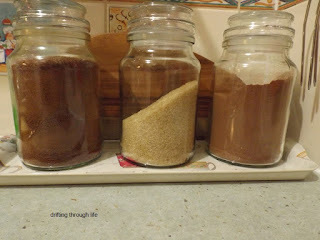 Milo is a chocolate flavoured powder, cereal based, to mix with hot or cold milk or water, or a combination of both. It's a drink, but I know quite a few people who sprinkle the powder on ice cream. I think the more limited our storage space is, the more efficient we become at making the most of it. Your organizational skills are really impressive. I've never been to IKEA before, because I thought they just sold build-it-yourself furniture kits. And Swedish meatballs... I've heard about them, too! Now I may have to check 'em out. Susan; they sell SO MUCH MORE than flat-packed furniture with allen keys. you really need to set aside a whole day to just wander around in there. Now that is how it is done! Stowed like a sailor. Boats are lacking in space and a good sailor knows how to use what he has and also get to what he needs quickly. Mrs. C could take lessons...me too actually. joeh; thank you, maybe I learned something when I was a baby on a ship coming out from Germany. Or maybe it's the Swedish heritage showing up in my use of wall space and Ikea items. 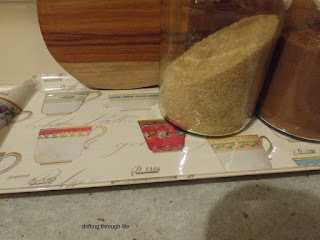 Of course a big thank you goes to my mum who had similar organisational habits. You are so organized it's almost scary!! fishducky; it's how I grew up, everything in its place, no need to spend precious time looking for "that thing that should be right here but isn't". The one messy spot is the table where I have my dinner, my laptop, my printer, my books:-:it's the only table in the house so everything goes on there. You are extremely organized. You could give lessons. only slightly confused; I've seen books written by people who claim to be able to declutter and organise a home for anybody and they get paid good money to do so, but I don't think I could do it. messymimi; thank you. For me it's the only way to live. Heh, heh! 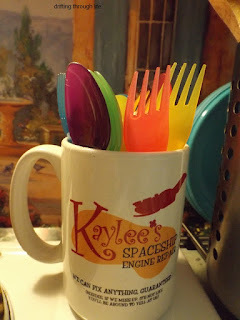 Your cat food plates and utensils look exactly like the set I bought on a whim for my son at college! I like that shelf stacker, and the rail and hooks for the utensils. They get all tangled in a drawer. Val; I bought the cat food plates and utensils at one of those "two dollar" stores called Cheap as Chips, of course everything in there ISN'T two dollars anymore. I liked the rails and hooks for my mugs, then saw how useful they'd be for utensils to. Snoskred; thank you. It's such a small kitchen, if you blink you'll miss it. I like the Swedish idea of using wall space where possible. 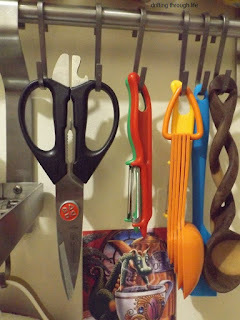 Wow, you have utilized every inch. I love the idea of the trays at the back of the stove. Brilliant and I will borrow. Arkansas Patti; the tray behind the stove are a life saver. 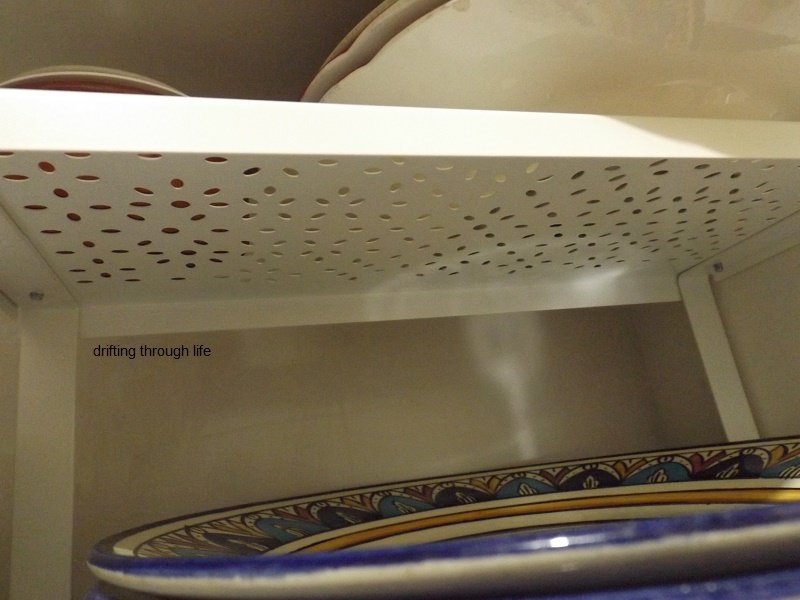 I have trouble with my neck and shoulders and with the range hood being set too low, there's no way I could get those tiles cleaned. Very well organized. You've made every inch count. Oh, and I keep the cat utensils in a mug beside the microwave as well! 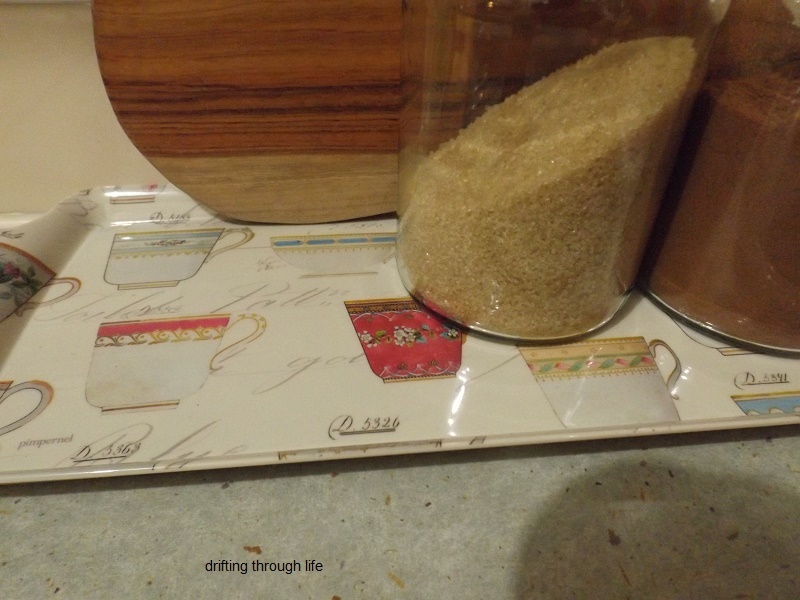 I warm up the canned food to room temperature before feeding so that's the best place for them.